I’m not really sure why I started cycling. Maybe there was a vague remembrance of childhood enjoyment or passing cyclists subconsciously called out to me, but three years ago I got a notion to ditch my car and start cycling to work and college. It didn’t happen overnight, but here I am, pedalling a 28 kilometres roundtrip three times a week. And for the most part, I love it. The first time I cycled was in the Phoenix Park with an experienced cycling friend who watched me wobble and provided pointers. In the beginning, I cycled just the 10-15 minutes into college and into town. The first time I ventured out to my job in Swords, that same friend came with me for a test run. Although I’d cycle to work occasionally, I still drove most of the time, thinking the journey too long. A kind-hearted car thief put a stop to that. He did me a favour, really. While it took a few months for total dependence on the bicycle to kick in, I’d moved farther away from my job. The journey to work that had seemed so long by bicycle had now doubled, and there were extra hills thrown in for good measure. 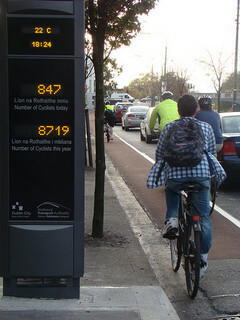 But as the bus stop was a good walk away, cycling was now the faster and more direct option. When I started commuting frequently, I was glad I’d had practice. I had the confidence to interact with traffic and knew my bike well. I didn’t realise how important this is until I fell off a borrowed bike after breaking too hard at the bottom of a hill. The tighter breaks on my heavier bike would have accommodated the sudden stop – the light bike I was on buckled under the weighty panniers and went from under me. It’s worth noting that this is the only accident I’ve had in three years. My commute begins on the North Circular Road on busy streets with heavy traffic before heading out toward the suburbs with cars enjoying 80km/h speed limits. Both stages can be both pleasant and unsettling. It’s nice to sail along the inside of cars and buses in town when they’re not moving but frustrating to get caught at traffic lights frequently when there’s an unfortunate phase. Other annoyances are finding cars randomly blocking cycle lanes and having to use poor cycle paths in the first place – ones which expect you to magically pass through solid objects like bus stops or end abruptly, dumping you into oncoming traffic. On the open road toward the airport is a great cycle. There’s no worry about slowing down and few traffic lights. But when a car or bus goes hurtling past you at the aforementioned 80km/h quite closely, it can be intimidating. Sometimes you realise how vulnerable you are. Fortunately most drivers give a wide berth. There is the odd driver that makes me question human decency sometimes. I don’t know when it became acceptable to scream at or threaten others in the street.Sometimes I wish I had a plaque on hand that says: “I’m a wife/mother/sister/daughter, trying to get home/to work, who just happens to be on a bike”, to get aggressors to see I’m a person rather than just a cyclist. On occasion I’ve felt like never getting on a bike again because driver behaviour has annoyed me so much or genuinely frightened me. But thankfully, these incidents aren’t non-stop. In the same way that not all cyclists can be tarred as red light runners, not all drivers can be painted as intolerant and impatient. The majority are fine. On the whole, I love cycling. I love the feeling of the wind whooshing by me on the way down a large hill that I pushed myself up. I love the consistent journey times and the occasional sense of achievement when a few minutes are shaved off. I love the time to myself that I wouldn’t otherwise get, and knowing that my journey was worthwhile because it doubled as my exercise for the day. I think I’ve shown my colleagues by arriving into work in one piece each time that it’s not too dangerous or difficult and I’ve reassured my initially wary family of how safe and enjoyable it is, to the point where they’re envious of my cycling life. I never wanted to be one of those cycling pushers, who cajoles everyone they meet into giving it a go. When I hear someone despairing though, about the cost of petrol, or not having the opportunity to exercise, or waiting on buses, I occasionally pipe up with, “why not cycle?” Because that is the one thing I would really like to change about cycling – I wish there were more of us doing it. It may seem obvious, but take any bike you like the look of for a test spin before you commit to buying. Consider too all possible uses for it – if you think you’re only going to use it occasionally then you might not feel like investing that much but it would be a pity to discover 12 months down the line when you’re cycling daily that you need a trade in. It’s not essential, but heading out those first few times with someone who knows what they’re doing can be a big confidence booster, not to mention good fun. Cycling may seem like a solo sport but it is really enjoyable with a partner so even going out with someone who is not that experienced could do you the world of good when you’re starting off. You wouldn’t get behind the wheel of a car and expect to drive to work on your first go, so don’t think a bike should be different. Take the time to learn how to safely manoeuvre, make sure you can look behind without veering wildly, and get your hand signalling sorted. It’ll stand to you when you’re in traffic and have to react quickly to other road users’ movements. Finding a quiet street or park where you won’t feel under pressure to perform will help to build confidence. While the weather in Dublin is not as hideous as it may seem, and most of the time you can be quite lucky and miss a downpour if it does happen to be raining, it’s good to have some wetgear to hand, just in case. You’ll be pleasantly surprised by how little you need it, but glad it’s there when you do. You don’t need to carry a full maintenance kit each time you head out on the road but it’s good to know how to fix simple problems like your chain coming off. 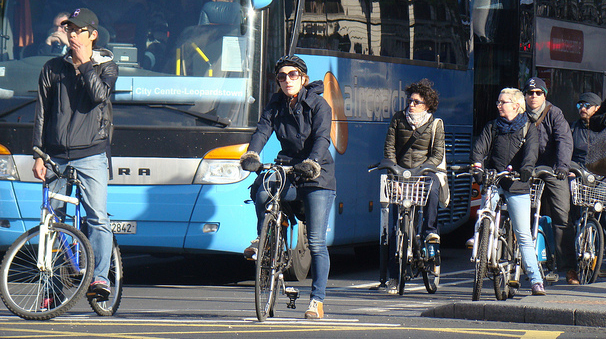 It can make the difference between getting to work on time or having to abandon your bike for the bus. Tip: keep a pair of disposable gloves in your handbag or backpack to avoid an oily mess. If you can leave a few changes of clothes at the office at the start of your week, then you’ll have even less to think of before heading out the door in the mornings.